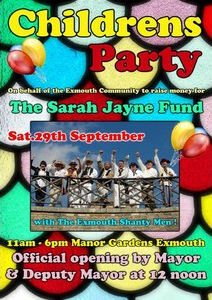 On 29th September 2012, Riviera ARC will be on air with club callsign MX0RIV in support of the Children’s Party in aid of the Sarah Jayne Fund at Manor Gardens, Exmouth, Devon. The trawler Sarah Jayne capsized off Berry Head, near Brixham on 11 September 2012. Skipper Geoff Ingram, M0AGI, lost his life in the tragedy. An account has been set up especially for the family, please make cheques payable to: "Sarah Jayne Fund". This entry was posted in Events and tagged Exmouth, MX0RIV, Sarah Jayne Fund on 28/09/2012 by G2DXU.